It’s what we take pride in. Our charter is to make the best UV inks in the marketplace, and accompany them with quality technical service throughout. Coated and Uncoated – When paper substrates are your focus, our Coated and Uncoated lines can provide PANTONE reproducibility across the board. Fade Resistant – When you need a product with higher fade resistance properties than standard four color process pigments, reach for our fade resistant line. This product line is available for all substrates. Jalopi – Ideal for lamination and improved adhesion, the Jalopi line is suitable for credit card/gift card lamination applications, and for printing on hard to adhere plastics when a coating or OPV will be used to overcoat. Nestle Compliant – Developed for the food packaging industry, our Nestle Compliant series is formulated in accordance with the most recent Nestle Guidance Document. When properly cured, migration from the inks is expected to be minimal. Opta – This line of inks is designed to cure well with the new high output bulbs that increase UVA intensity and filter out short wave UVC. Great for better through cure, especially for dark colors and whites. Soya – Produced from soy-derived raw materials, our Soya line possesses adequate content to carry the American Soy Association Soy Seal. XCure – When higher press speeds demand faster cure times, the XCure line may be the best choice. Modeled after our Super Cure line, XCure ramps up the curing potential when needed. These ink are recommended for paper substrates only. 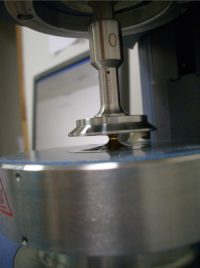 XS and XS Plus – Tape adhesion is critical on plastic substrates. Our XS and XS Plus lines are ideal to meet this requirement. Both are coatable, though compatibility with a given coating should be validated in advance. Super Cure – Our workhorse product for plastic substrates. Good reactivity and adhesion make Super Cure an excellent choice for most plastics, including polyethylene, polypropylene, and PET. Synthis – Excellent for plastic substrates, our Synthis line has the gloss and adhesion needed to print the job in vibrant color. Not designed to be overcoated. Waterless – Our new Waterless line performs with excellent print clarity and color on all waterless presses, with minimal toning and waste. Many of our inks can be supplied in wax free, low tack, or high tack versions. Just let us know what you need!